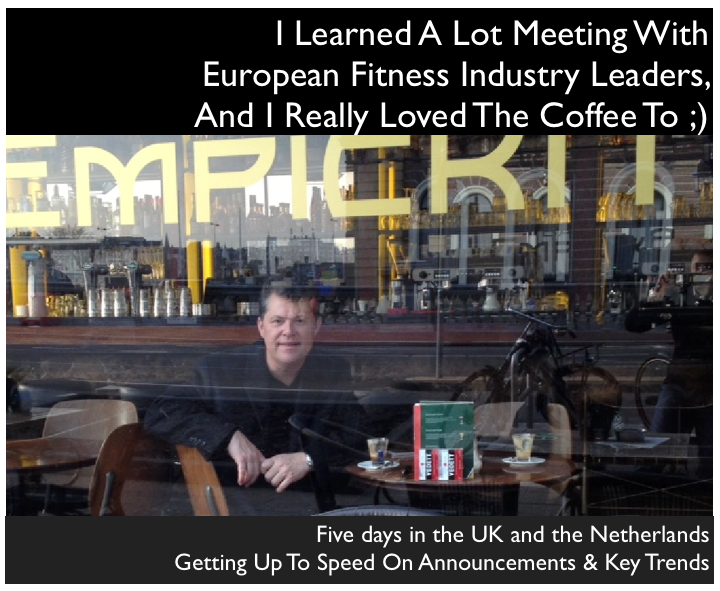 Yes that is me in a coffee shop in Amsterdam and no not one of THOSE Coffee Shops ;) . I love coffee and was in that business for six years running a chain of cafes and a full roasting operation. So heading to Amsterdam I always enjoy some great espresso, after all Amsterdam is where coffee was spread around the world from in the 17th and 18th centuries. But that's not why I went this time. It was for a more interesting reason. When one of the biggest players in the global fitness business invites you to come along to Europe and lend a hand, well who's to say no ? Getting to meet executives from some of the leading clubs chains in the UK and EU in general as well as distributors for Star Trac in the EU, Middle East and Africa is a wonderful learning experience. The information gleaned tells you something about where the bricks and mortar fitness business is heading from a global perspective. That helps me keep a perspective on trends and enables us to serve our customers at Fitmarc, Integerus and Fitsomo even better. More than anything seeing the turnaround at Star Trac continue through the eyes of its owner, Michael Bruno, as I have over the past few years, continues to be a motivating experience. There is no one I've met or known, save a handful of people including my partner and friend Robert Dyer and my wife Maureen O'Rourke, who are as committed to success and the customer as Michael Bruno. That he invites me to contribute to his global business is an honor I relish. In the interest of confidentiality, I can't disclose who we met with exactly, but what I learned was that many clubs are focusing on i) elevating their group fitness and in particular indoor cycling studios and classes and ii) focusing on small group training. Sounds like the US a bit doesn't it ? There is also keen interest in alternative cardio, particularly around Star Trac's approaching launch of the Commercial Treadclimber, which is likely to be a significant home run for the Star Trac brand. As with most mature markets, the UK market is going through the bifurcation trend of consumers, with budget and niche studios taking larger share. This only serves to reemphasize the need for smart competitors to get very focused on their core business models. "Clubs doing well in Europe and the United States are either high end or budget clubs, because people want to cut back while still keeping gym memberships," said IHRSA spokesperson Alison O'Kane. "It's squeezing the middle market a lot...."Europe and the United States are the most advanced markets, so the trends will start there," O'Kane said. "There are more clubs open in Europe but America has more club members on average." According to the European Health and Fitness Associations Annual Report the EU marketplace generates 22 Million Euros in annual revenues with 40,000 public and private facilities that serve 44 million members. This is of comparable size to the US market. Despite recent economic struggles things are looking up. There is a lot we can learn by paying attention to the European marketplace. What do you think about the health club industry in Europe ? Do you see a similar focus on group fitness and small group training in the states ? I think there are many similarities and some differences but I'd love to hear your point of view.